Take advantage of cheap Aer Lingus flights from Dublin to Faro to explore the beautiful Algarve. Enjoy a city break in Faro, or venture beyond to bask in sunshine on the stunning, scenic coast. From Silves Castle, picturesque fishing villages and museums to world famous golf courses and diving experiences, there are many attractions and sights to ensure a great holiday. Book flights from Dublin to Faro with Aer Lingus for a fabulous city and sun break. Catch a cheap flight to Faro with Aer Lingus and enjoy a comfortable journey from Dublin Airport’s Terminal 2. On arrival at Faro Airport, take a taxi or bus to the city centre, which is just four miles away, or take advantage of a car hire deal with our travel partners. 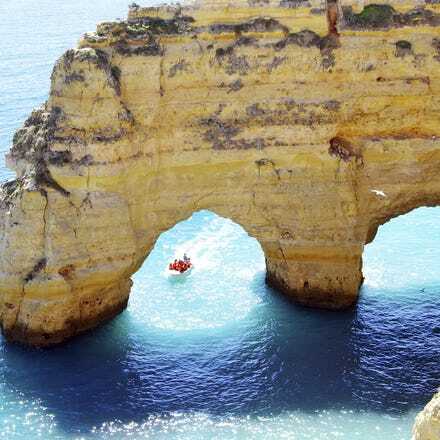 Many people say that Faro 'the capital of the Algarve' is located on Europe's most scenic coast, offering beautiful, long sandy beaches that stretch away into a horizon framed by rocks on either side. Faro is a charming old town with cobbled streets and leafy parks. Its location in the centre of the Algarve makes Faro the perfect starting point for round-trips. Faro’s international airport is located right by the sea, and the city is only around three miles away. You can easily hop on a 14 or 16 bus – journey time is around 20 minutes, and buses depart regularly. You can get a ticket from the driver (try to have some change handy if possible). If you’d prefer to take a taxi, the journey will take anywhere between 10 and 15 minutes. Getting around the beautiful Algarve is simple from Faro – the city’s train station is well connected. There’s also the bus network EVA, which is often considered more reliable than the trains. For more local journeys, there are also Proximo buses, though it’s much better to explore Faro on foot if you can.